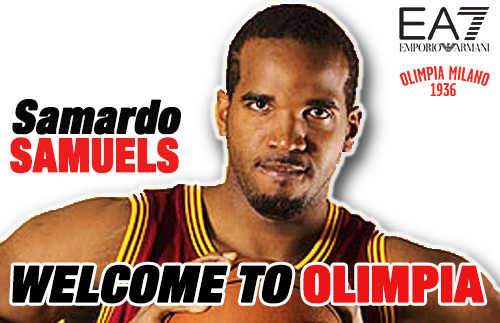 Pallacanestro Olimpia EA7-Emporio Armani Milano agreed on terms with Samardo Samuels, a 2.08 center coming from Hapoel Jerusalem where he played for two months after spending three seasons with Cleveland Cavaliers of the NBA. WHO’S SAMUELS? – Samardo Samuels was born in 1989 on January 9 in Trelawny, Jamaica. At 14 he moved to the United States with a scholarship to attend Our Savior New American School in Long Island. In his U.S. first year he was spotted by coach Dan Hurley when his team played twice against the St.Benedict’s High School of Newark, New Jersey. Hurley recruited him and the team finished the season 28-1 and number 1 in USa Today’s ranking. In 2008 he was also named High School Player of the Year. He was recruited by Rick Pitino to play for Louisville where he stayed two years starting in all the 70 games he played. In his first season he averaged 11.8 points per game, 4.9 rebounds, 1.3 blocks and in 25.1 minutes per game he shot 57.8% from the field. Samuels was also named four times rookie of the week for the Big East Conference. In his second season, he lead the team scoring 15.3 points per game, and averaged 7.0 rebounds per game, 1.1 blocks and played 29.3 minutes per outing. He was named in the All-conference Third Team and scored 36 points againast Notre Dame. in 2010, he left Louisville two years early but remained undrafted. He still had a great summer league with Chicago, good enough to earn him a three-year contract with the Cleveland Cavaliers. His rookie season was the best, 7.8 points per game, 4.3 rebounds, 19.0 minutes played on average, 37 appearances, 10 starts (during which he averaged 12.9 points per game). In 2011712 he played 54 games in Cleveland with 5.4 points and 3.3 rebounds in 15.3 minutes, with a season-high of 17 against Detroit. In 2012/13 he played 18 games for Cleveland with one start, 3.2 points and 1.6 rebounds. Released by Cleveland, he played for the Reno Bighorns of the D-League, averaging 19.8 points and 10.3 rebounds per game. With two months remaining in the season, he moved to Hapoel Jerusalem where he played 13 games averaging 12.2 points with 4.0 rebounds per game in 22.4 minutes. He scored 20 points against Maccabi in the playoffs (22 was the season-high against Netanya in the quarterfinals series), in game 2, and grabbed 12 rebounds (another season high) in game 3.